I havent got a goose but I am plump enough already. This week I have been making some christmas themed brooches to sell on the Notonthehighstreet shop as well as at the few fairs I am doing in the run up to the big day. I love christmas and am one of those people who start writing my christmas list as soon as my birthday has passed (which is in April im afraid). I also try and buy handmade items for friends and family to go with some things made by my own fair hands and try to encourage them to do the same for me. Although this year my biggest thing on my list is a new sewing machine, my old one is well on its way to technology heaven, I have got my eye on quite a few handmade items which are on the list too. So I thought I would share a few with you, obviously I dont expect you to buy me anything as I may not even know you but if you know my mum or boyfriend then pass the link on. Or indeed add some of them to your list and there are some real beauties on there. 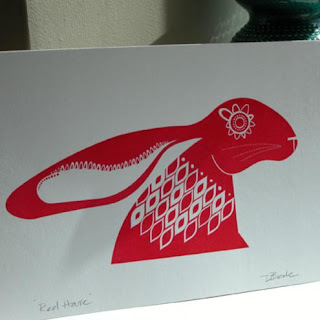 Firstly something to brighten up my kitchen, this scandinavian hare print by Dee Beale is simple but so striking. I love red, it is my favourite colour and I love the way that the pattern on its fur mimic scandi knitting patterns. Something to adorn my neck all year round and bring out the rock and roll in you. 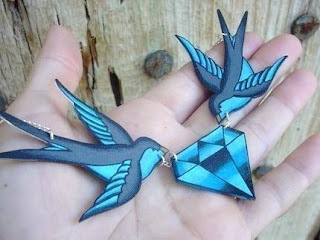 I love the tattoo inspired jewellery by Wicked Minky, this swallows and diamond necklace in my current fav. 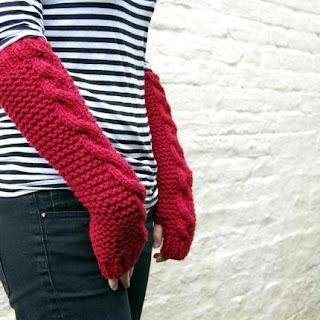 Because it is getting chilly outside I will also need a pair of these arm warmers by Dollyknits, see this is me being practicle. Again red just coz and there is always something lovely and cosy about anything cable knitted. Of course there is much more but I don't want to seem greedy. I would love to see other peoples handmade items on their christmas wish lists.